I was intrigued the first time I saw this recipe on a blog I happened upon a few months ago. 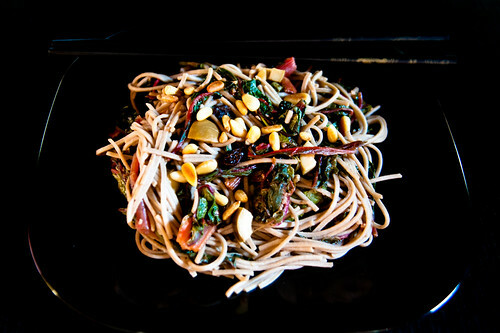 I had never cooked with or eaten Swiss chard before, but the combination of soba noodles with raisins and pine nuts sounded pretty good, so I thought I'd give it a try. The first time I cooked it I screwed up the soba noodles by overcooking them (that was dumb!) and it turned into a gigantic glob of gooey mess. Yuck. Whatever you do, don't overcook soba noodles. I tried again the following week and the dish was successful - a simple but solid combination of sweet and salty flavors. It was an enjoyable and easy-to-make dish.